Psyklax and I have released an English language translation patch for Sherlock Holmes: Hakushaku Reijou Yuukai Jiken a.k.a. 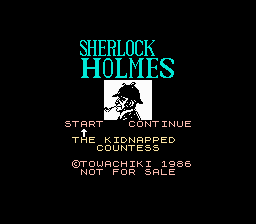 Sherlock Holmes: The Kidnapped Countess for the Nintendo Famicom. This game is notorious for it's unforgiving difficulty, and is ranked the 4th hardest game on the NES. According to the readme the game is an "arcade-style action game with puzzle elements". The game is described as follows: "The object of the game is to defeat seven bosses in different cities, and input a final password to access the last level. You also need to get your rating to 100% before you can complete the game. To find the bosses, you need to get information from NPCs by attacking them. The way to get the final password is by finding clues for your notebook and interpreting them based on information you receive: the sixteen clues are found by using your magnifying glass on certain objects. The magnifying glass and notebook also must be found, along with other items that are necessary to complete the game." Our hope is that with this English translation patch for Sherlock Holmes: The Kidnapped Countess, and perhaps a guide and some cheats, more people will be able to find some enjoyment from this historically frustrating title only released in Japan. In other news, the script for SWAT on the NES/Famicom is complete, and the project has moved into production. Psyklax will be taking a look at the technical work required for an English language patch. Hopefully I'll be able to post an update with more information in the future. 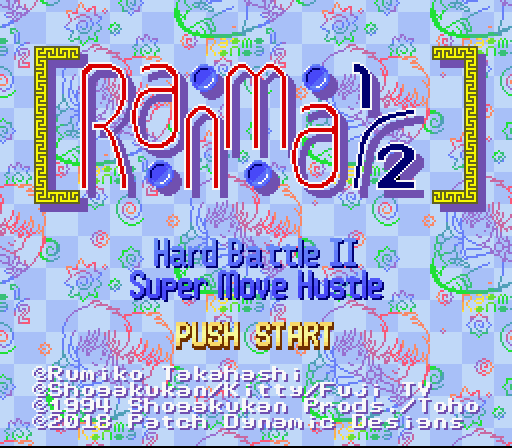 Also, my co-conspirators at Dynamic Designs have been hard at work on Ranma 1/2: Chougiranbuhen, a.k.a Ranma 1/2 Hard Battle 2: Super Move Hustle. I fully translated the script and was able to get it inserted and edited with the help of Bongo`. From there, Taskforce has done an awsome job of editing all of the game's Japanese text graphics, of which there are many, and Bongo` has assisted in ensuring they all insert without issues. Taskforce has also made a custom font, and is in the process of editing the script to accomodate the change in space taken up by the English lines of text. The Ranma 1/2 Hard Battle 2: Super Move Hustle English language translation project is nearing completion. Keep an eye out for a release in the near future. City Adventure Touch English Language Translation Patch Released! Approximately two weeks ago, Supper and I released an English language translation patch for City Adventure Touch: Mystery of Triangle. The story of how this project came about is somewhat winding. For starters, an anonymous user posted to this very blog on 07/25/2017 asking if I'd ever checked out City Adventure Touch. I took a look at the game, and being that it seemed so absurd, an action-adventure game using a license for the baseball manga "Touch", I had to try dumping a script. By the 27th, a couple days later, I'd fully translated the script. I posted this to RHDN's forum, in a thread about translating games for the Famicom from 1987, hoping that some of the folks frequenting this thread might decide to use the script to make a completed translation patch. On February 2nd, having not heard anything more via the previous thread, I decided to post a help wanted ad on RHDN for the project. Partner in crime, Supper, responded and made some quick progress on inserting the script and editing the game to facilitate displaying the English text. A response on the request for technical help with City Adventure Touch: Mystery of Triangle by Digitsie informed us that they'd previously found someone to translate the script for KingMike, and had only just passed the translated script to them. Following up on this, Supper and I found that KingMike was at least still interested in working on the project, and after some discussion, we decided to each proceed on our projects, rather than letting our individual work go to waste, so-to-speak. This is not an uncommon occurrence when working on translation projects, but it's unusual for such an obscure, and seemingly unpopular game as City Adventure Touch. Suffice to say, Supper finished work on editing and testing the English version, and we released the patch publicly on February 12th, 2018. You may visit my English language video game Translation Projects Page or RHDN's project page for the fully-playable English language translation patch for City Adventure Touch on the Nintendo Famicom. Battle Golfer Yui English Language Translation Patch v0.9 Public Beta Released! Announcing the release of the v0.9 public beta English Language Translation Patch for Battle Golfer Yui on the Sega Mega Drive. Please visit the project page, for links and additional info. It's been a full 10 years since Guest did initial work on script insertion for this game. Flash forward, and Supper and I have completed what they started. This public beta includes work that has been played through, but there may be bugs or issues with the J->E translation. Please use the contact form to let us know about any issues or provide any feedback. We can also be contacted on RHDN. Page design and maintenance - Matthew La France Mail me with inquiries, comments, suggestions, complements, or criticisms.